I had no idea that the river view in downtown Little Rock would be so beautiful. The park is located directly across the river from the Clinton Presidential Library. While it may not have luxury amenities like a pool, the park has everything we needed. The site was a pull through with full hookups and plenty of room for our towed vehicle. I saw a pavilion that is apparently available for visitors to use. Anytime we need to be in Little Rock for a day, a week, or more, we will be reserving a space at the Downtown Riverside RV. We camped at Downtown Riverside RV Park in a Motorhome. Green Acres is the place to be! I was sold on the park even before we got here because of the park name and the fact that the roads are named after Green Acres' characters. It is a lovely park located close to the Shiloh National Battlefield. The sites are pretty far apart and the full hookups are great. Our pull through gravel site was long enough for at least two Class A Motorhomes and two cars. No kidding. It was a huge site. The amenities are note worthy too. The in-ground saltwater pool was clean and well kept. I actually took a dip in the pool (I never do that). I didn't peek into the laundry or the bathrooms, but I'm sure they are just as good. There were several gathering areas around, including some swinging benches on a concrete pad near the pool area. Some sites are for monthly rentals. I wouldn't have known that if the owners hadn't told me. Everything is tidy here. The landscaping is obviously a priority and cable tv is provided. Out of all of the parks we have used so far, Green Acres has superior Wi-Fi. So much so, in fact, that we didn't use our access points. This was a first for us. We will be sending everyone we know to Green Acres. We camped at Green Acres RV Park in a Motorhome. Make sure to visit the Shiloh National Battlefield. 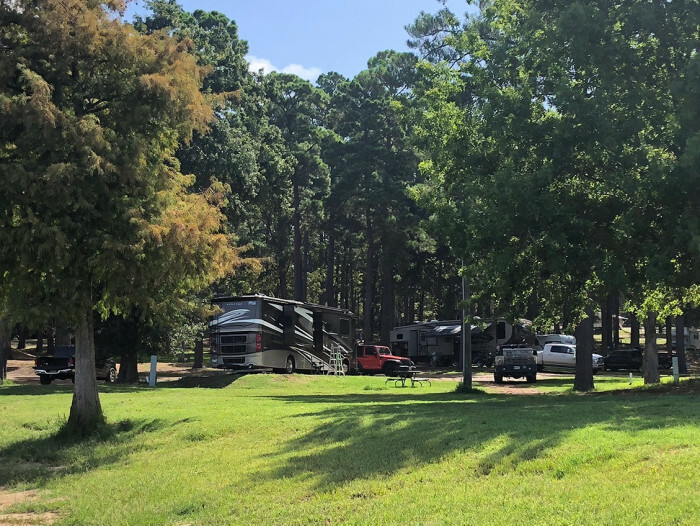 Many, LA - August 2018 - Cypress Bend RV Park - $25-35/night. Cypress Bend is a little bit off of the beaten path and worth making the trip off of the highway. We stayed in site 6. The park is wooded and hilly with many level sites. We had a full hookup 50 amp site near the water. There are no pull-through sites, but this isn't a traditional set-up. The sites are pretty far apart and each site has adequate parking. The park office is nice and the staff was friendly. We did not check out the bathrooms or the laundry. This is a gated park with controlled access. There is a large pavilion, boat launches, docks, parking areas, cabins, and RV spots. It is a pretty park. We had no trouble with neighbors, noise, or traffic. There were a ton of bugs, but I suppose that is to be expected. We look forward to our next trip to Cypress Bend! Note: The utilities are further away from our hookups than we are used to. We had a long hose and extra sewer hoses, but couldn't connect our sewer rinse hose. Take those extra water and sewer hoses! And don't forget the bug spray! Bring extra! 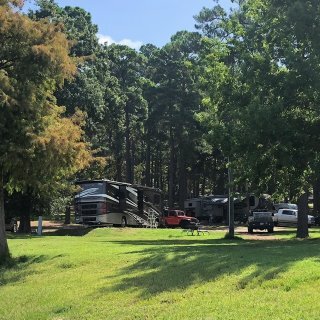 We camped at Cypress Bend Park in a Motorhome. I'm glad I didn't get hung up on the reviews we found online. We had a recommendation from a friend that we relied upon. Rockport- June 2018 - The Copano Bay RV Resort - Cost $190.00/week - Copano Bay RV Resort has daily, weekly, monthly and longer term rates. Since the hurricane in August of 2017, the community has been working hard to rebuild. This edge of the park is right on Copano Bay and there are lovely views of the water. It also has a swimming pool with shade and seating and a really nice fishing dock out on the water. Near the swimming pool, a small dog park area is provided. There are quite a few long term residents, but unlike some other parks we have seen, all of the residents keep up the property. The sites are set up in traditional RV park manner, each space being parallel to its neighbors, and the spaces are pretty close together. Our site was just long enough to accommodate our motor home. We would have had more room, but the utility post was tall enough to keep us from backing in further due to the location of our super slide. We had room to park our Jeep next to the RV. The streets in the park are paved and all of the sites are concrete and pretty level. Most of the sites are lacking trees, picnic tables, and/or benches and chairs. None of them seem to have grills or fire pits. That being said, I really like this park and find its location and staff to be better than I expected. 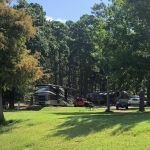 There are many many RV park options in the Rockport/Fulton area and I am pleased with the park we chose. We camped at Copano Bay RV Resort in a Motorhome. June 2018 - $38.00/night. What a beautiful park! We stayed seven nights in space 25. It was more than long enough to accommodate our 40' coach and Jeep. The pad was concrete and the lot was well shaded. A picnic table, a tent pad, a grill, and a gravel and concrete patio area made it even more welcoming. The trees and underbrush are thick. While it is beautiful, it limits the amount of wind coming through. It was perfectly still outside of our coach. It was also very hot and humid. The park has very nice facilities including bathrooms, laundry facilities, an amphitheater, a pavilion (actually a building with walls and a ceiling), an ADA accessible hiking trail, and work out equipment along the trail. The diamond mine and water park are within a comfortable walking distance. We didn't try out the water park, but it was pretty popular with other families. We would stay here again! We camped at Crater of Diamonds State Park in a Motorhome. We loved this park! It is brand new. The pads are all concrete and level. There was enough room in our spot to park our toad and another car - one at each end of our 40' motorhome. The facilities are gorgeous. Bathrooms, laundry facility, dog park, pool, fishing pond, clubhouse, roads, utility hookups - everything is awesome. We would definitely stay again. We camped at By the Lake Rv Park in a Motorhome. Very near Lake Murray State Park and I-35. Go eat at the Fireside just about a mile down the road for an awesome steak or into Ardmore for great local food. I highly recommend Two Frogs, Cafe Alley, and Interurban. Have fun! We had a beautiful view of the river. The amenities were okay. The pad was gravel and we had a picnic table. We were able to park our toad in the space in from of our motorhome. The park was pretty full, but not noisy or unpleasant. We camped at Pecan Park Riverside RV in a Motorhome. Go to HEB if you need groceries!